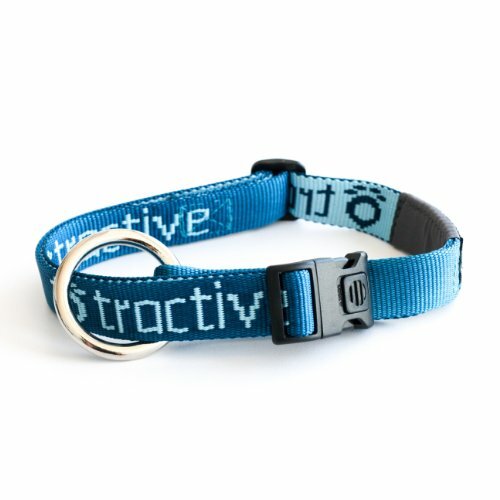 The Tractive Dog Collar is specifically made for the usage in connection with the Tractive GPS Pet Tracking device. A "low load ring" guarantees strain relief under high pressure. To prevent of unsolicited openings of the buckle, a special safety interlock is integrated as well. The 20 millimetres wide Tractive Dog Collar is length adjustable and can be adjusted to a length between 30 and 50 centimeters. It's Safety first with the Rogz Highly Reflective Utility Range, which is both the black tie and the 4x4 of the Rogz range. Timeless and classic, hardy but cool. Never shaken - or stirred. The 1" Lumberjack Side-Release Dog Collar with its woven reflective threads stitched into high quality webbing has been designed for Strength, Durability and Safety. Straight-forward and durable with ultimate night time visibility. Standard features include a locking Buckle, the ROG-LOC, the Fort Knox of side release buckles, which ensures the buckle stays fastened even during the most boisterous games; Ergonomic, contoured plastic components ensuring that every Rogz collar fits as snug as a pug in a rug; The Low Load Technology reduces the load on the buckle through a cleverly positioned load ring and Custom-branded die cast ring (no welding) with electroplated chrome for a rust, tarnish free finish. All joins are box stitched for extra strength and a quality finish. Note, this gear needs to be turned inside out when operating in stealth mode as the Reflective Stitching is only on the one side. The 1" Lumberjack collar adjusts for a neck size of 17-27". It's suitable for Rottweiler, Ridgeback, Bouvier, Labrador and similar sized breeds. Locking Side Release Buckle, the Rogz-Loc, makes these buckles completely dog-paw resistant. For added security the Low Load Technology (LLT) reduces the load on the buckle. Buckle-Breaking strength tested at 440lbs on a direct pull and 597lbs through the Low Load Technology. Our high quality adjustable collars with gorgeous and light weight Aluminum buckles. The collar is soft durable and washable and is made of sturdy nylon webbing. 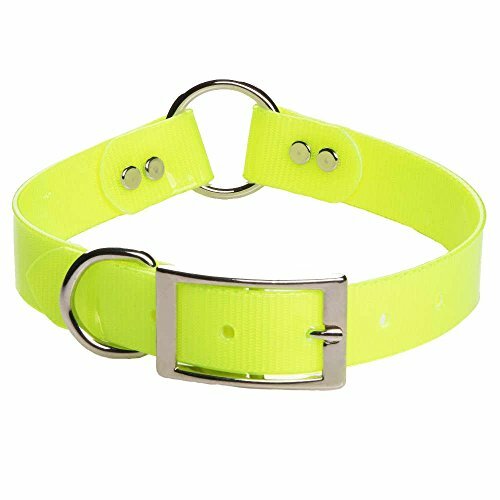 FeaturesType - Dog Collar Color - Neon Green Design - Aluminum Buckles Size - Medium 3/4 in. wide Adjusts 13-20 in. 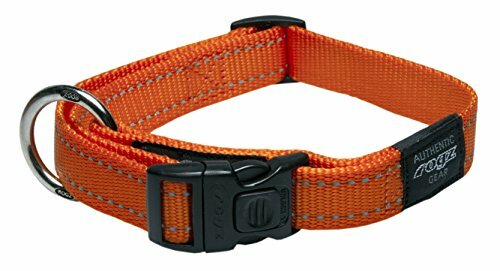 Whether you are walking your best friend in town during twilight or in the field at dawn, Mendota Safety Dog Collars will give your dog that extra visibility in low-light conditions. Made of durable Biothane material, these collars offer high visibility in the field, remain pliable in cold weather, clean up quickly, and will not hold dirt or scent from the field. They are also highly resistance to chewing, fading, and moisture. The collars are great for attaching a name plate and feature a Conway buckle, center "safety ring", and D-ring. Mendota Products offers today's dog owners, trainers and handlers the finest accessories available at a moderate price. Handcrafted "Made in the USA" construction, using only the finest materials, ensures premium performance. Our high quality adjustable collars with gorgeous and light weight Aluminum buckles. The collar is soft durable and washable and is made of sturdy nylon webbing. FeaturesType - Dog Collar Color - Blue Design - Aluminum Buckles Size - Small 5/8 in. wide Adjusts 10-14 in. Pet Attire Sparkles Adjustable Dog Collar With Metal Buckle-1 in. Black Neck Size 18-26 in. Our high quality adjustable collars with gorgeous and light weight Aluminum buckles. The collar is soft durable and washable and is made of sturdy nylon webbing. FeaturesType - Dog Collar Color - Neon Pink Design - Aluminum Buckles Size - Medium 3/4 in. wide Adjusts 13-20 in. Our high quality adjustable collars with gorgeous and light weight Aluminum buckles. The collar is soft durable and washable and is made of sturdy nylon webbing. FeaturesType - Dog Collar Color - Red Design - Nylon/Aluminum Buckles Size - Medium 3/4 in. wide Adjusts 13-20 in.